Step 1 (90% complete) During 2015-18 through the California Voting Rights Acts foment a transition to district elections by 2018 in 50-100 southern and central Cal cities and school districts (and special districts) in which voters from minority and or excluded communities can elect candidates of their choice. Step 2 Recruit and train local candidates to run for office in the newly created districts thru the Latino Academy. Trainings in Aug 26, 2017 at Riverside Mission Inn and Feb 3, 2018 at Morongo Casino. Step 3 Conduct voter 10-day registration canvass in 25 CVRA jurisdictions during April 22-May 5 in conjunction with SVREP CRVA committees in each locality; SVREP will pay stipend to a local organizer if local committee provides matching funds to support volunteers. Goal is to register 10,000 voters in key districts. Commerce Casino focused on voter mobilization and campaign implementation. Sept 21 Hispanic/Latino Heritage Month Latino Vote Reception, location TBD. Note that CVRA-GOTV is not contemplated as SVREP does not support candidates. By Oct. Candidates should be doing their own campaigns. Step 7 Through the William C. Velasquez Institute conduct Nov 30/Dec 1 policy conference to help prepare victorious candidates to govern!! Note: CVRA general cycle site selection will depend on performance in previous phase as well as strategic importance. Note: SVREP sent the following letter to 134 community leaders that are involved in its CVRA training and pre-organizing activities. Southwest Voter Registration Education Project (SVREP) calls on leaders from communities that have recently transformed into single member district election systems thru the California Voting Rights Act to form voter registration committees to register minority voters in the newly created districts during Latino Voter Empowerment Week (April 22-May 5). 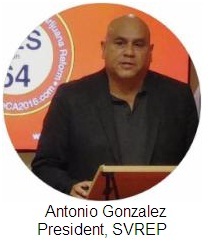 You are receiving this invitation because you attended or replied to SVREP CVRA appeals, regional meetings, or Latino Academy trainings during the July 2017-March 2018 period. We believe that even though the CVRA has enabled a minority “population” district to be drawn in your cities and/or school boards, voter registration still must be done to translate those numbers into voters before Nov 2018. Our Latino Voter Empowerment Week exercise is the first wave, to be followed by more in summer and fall. On average we believe 250-500 registered voters is achievable in each community this spring. Our goal is to run as many as 25 voter projects in San Bernardino, Riverside, Orange, Los Angeles, and San Diego Counties. Edin Enamorado ( edin@svrep.org ) (323-205-2190 ) from my office has been reaching out to you and is available to come to your community to meet with your committee during the March 5-April 13 period. Your committee must provide volunteers to do the work, as well as food and refreshments to sustain their physical and emotional morale. I hope this project excites you as well as it does SVREP. Please respond affirmatively with your interest directly to Edin Enamorado who will be coming to your community to visit with you in the immediate future. Below I have attached SVREP's complete plan for your edification.